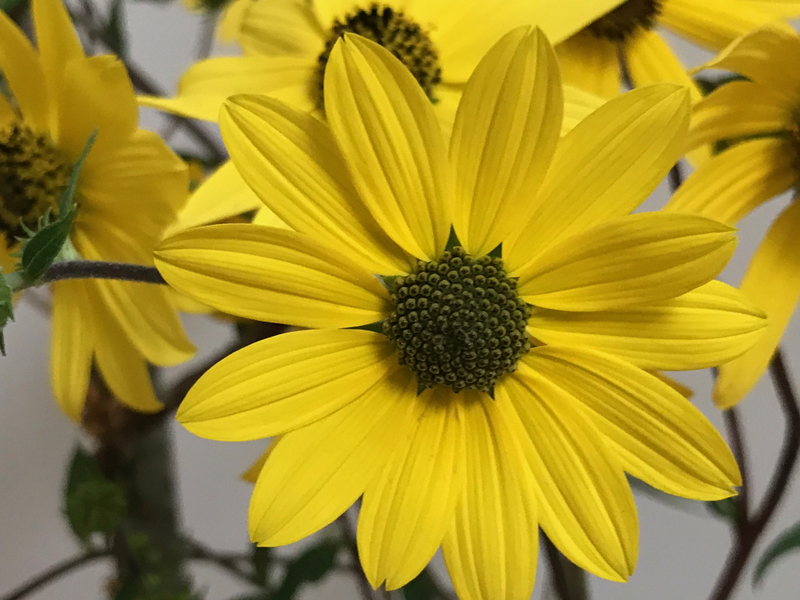 Each Monday Cathy at Rambling In The Garden invites us to share an arrangement composed of materials collected from our gardens. 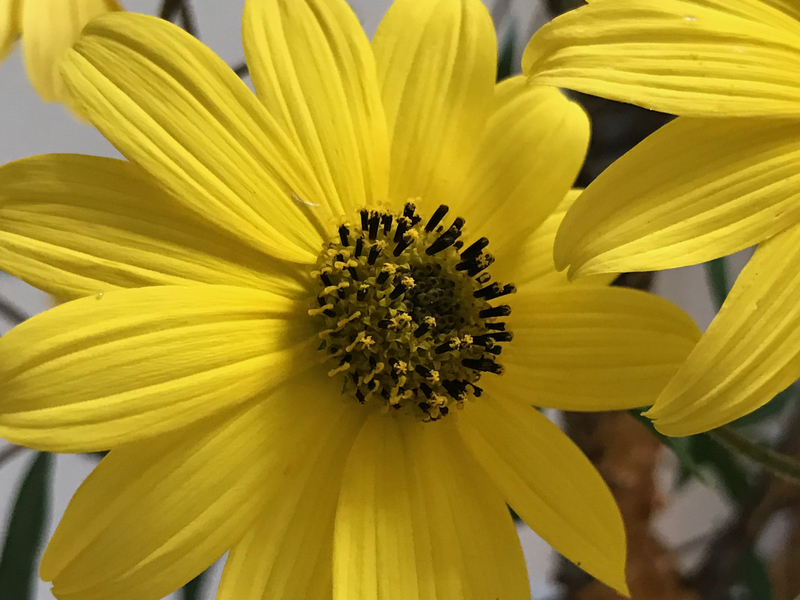 The weather continues to feel very summery but autumn reveals itself this week in the bright, yellow glow of Swamp sunflowers currently dominating the western border. The sunflowers are the focal point of this Monday’s vase. A lichen-covered branch from the river birch out front is used for structure and visual texture. This arrangement really is a lot of fun in person but its personality proved difficult to capture in photographs. The Swamp Sunflower has its attractors, including this Fiery Skipper (Hylephila phyleus). 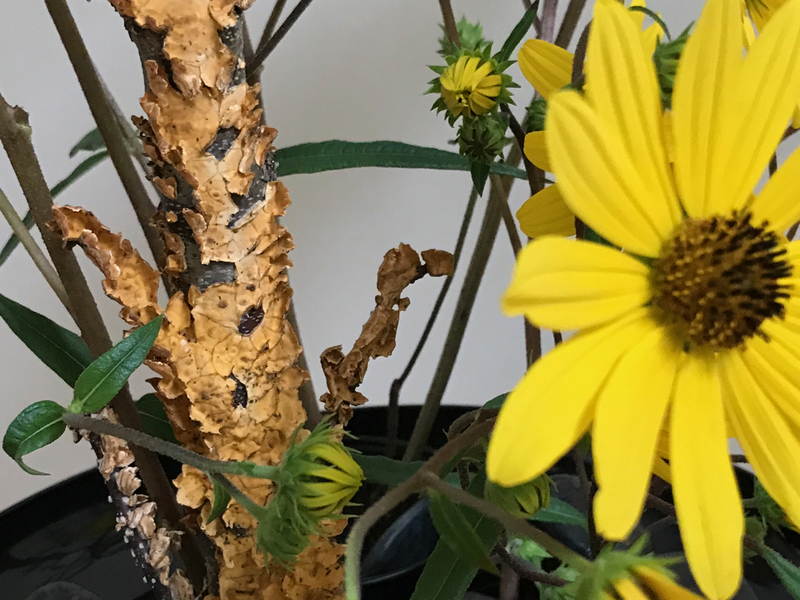 This entry was posted in garden and tagged 2018vase, autumn garden, Helianthus angustifolius (Swamp Sunflower), lichen, nature photography on October 1, 2018 by pbmgarden. Very cheerful and sure to make everyone smile. Making life a little brighter. Thanks Alison! Smiles are good. Perfect October vase. I love all those visible stems creating patterns in the air. I fretted over those stems, but now I see them differently. Thanks Linda. I think you captured the personality of this arrangement perfectly! It’s so very unique–I like it!! Thanks Joanna–this vase made me cheerful each time I passed by it. Such a creative arrangement and I love your use of the branch. Thanks. I saw more curves and movement in that branch than what showed up in the photos–a fun experiment. A bit of summer sunshine is always welcome as the days grow shorter and colder! The carefree stem patterns are fabulous! Thanks Peter. I do notice the shorter daylight but so far we’re still very hot. I love this Susie – on the face of it so simple but you have placed things perfectly that the ened result is an artistic triumph. Are the frogs just loose in the dish, or have you some way of keeping them in place and stopping the arrangement from overbalancing? Thanks Cathy. The frogs are held in little black dishes, one is weighted and the other I just balanced carefully. Professionals would secure the dishes with some florist’s material (I forget what it’s called). Beautifully arranged and full of personality if you ask me! Those daisies look like they are dancing. 🙂 I love branches covered in lichen too. Thanks Cathy, I’m glad their personality came through. This vase made me happy. Beautiful! I wish I had sunflowers like that to brighten my garden but I suppose anything with “swamp” in the name isn’t likely to be happy here. 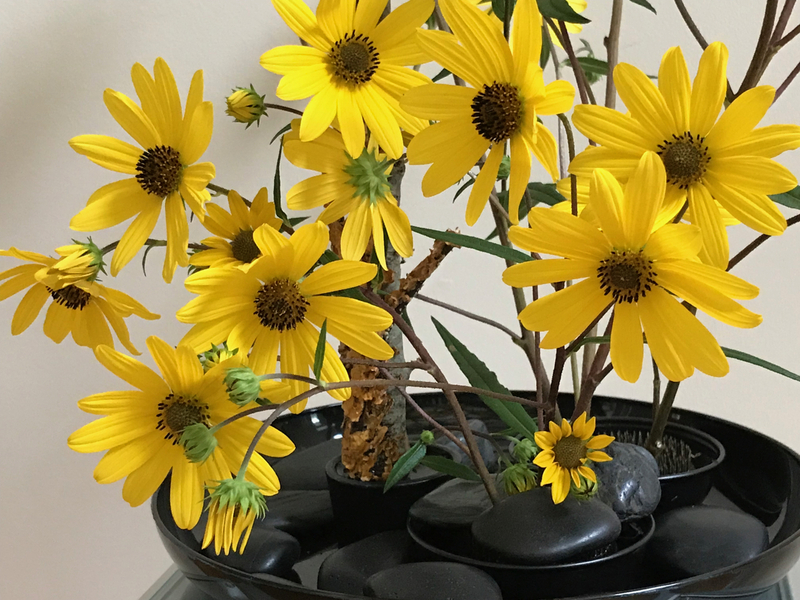 Perhaps a desert would hold swamp sunflowers at bay, but I’m not having much luck. I’ve tried to completely eradicate it, but this time of year it fills the garden with bees, butterflies and yellow. My first reaction a big smile…then admiration for the quality of the blooms and the arrangement. Lovely. Thanks Noelle. It made me smile too this past week. The branch is such a nice touch in this happy composition. Thanks Ricki. I loved the texture of the lichen. Thanks so much. Glad you enjoyed it. That hot yellow does have an effect. 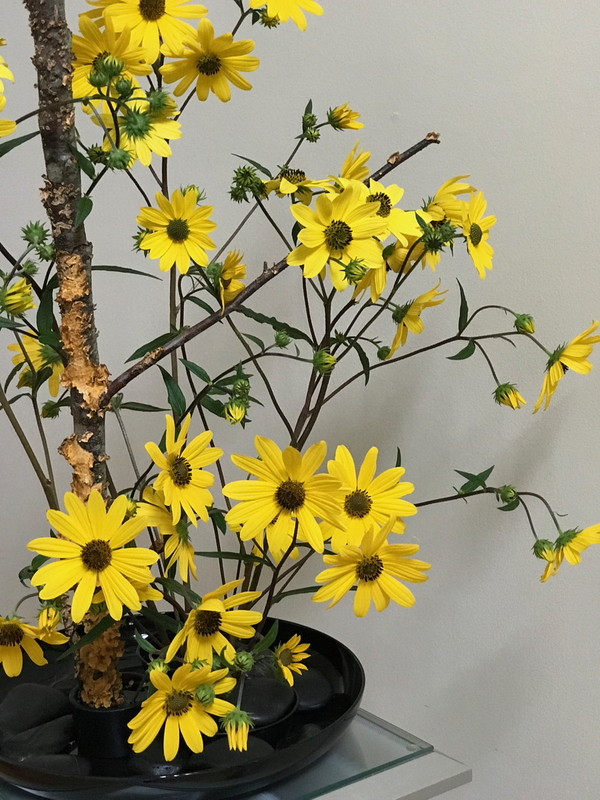 Love it, sunny yellows, accented by what I thought that was a River Birch branch! So aggravating that photography thing! Enjoying it now and would like it better in person I am sure. Thanks! I don’t have many yellows in the garden but this one seems appropriate for the time of year. 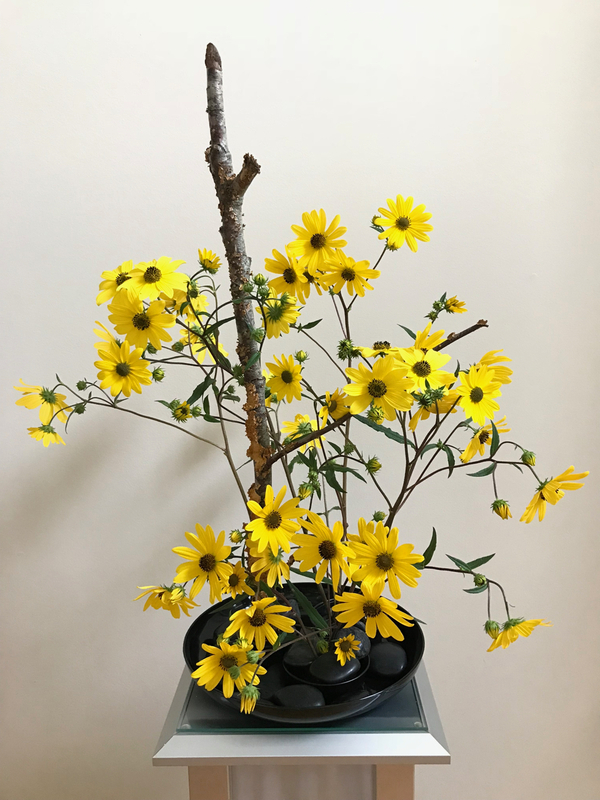 Yes, swamp sunflower is native. Way too aggressive though. Love the lichens and the delicately crossed stems of the sunflowers. Great job capturing the saturated yellows, I never manage to pull it off! The light must have worked in favor of the yellow this time. Sometimes the color in my photos is much more subdued than actuality.